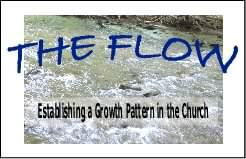 The Flow helps us see how this overall training process works by combining two larger concepts. (1) 1 John 2:12-14 shows how when each Christian is trained at one level, then he or she will grow to the next level. (2) Ephesians 4:11-14 reveals the higher purpose of our training is to involve all the members in service to the King. As a Christian is trained on one level, then he or she can train others at that level. The training is not academic but practical. The training is not public but personal. When Christians are trained to disciple other Christians that are at an earlier point in the growth scale, they both greatly benefit. One might think to put such a program into place would be very difficult. It isn’t. It just takes vision, materials and perseverance. Vision helps one focus on what needs to be done by revealing where one should be. It is like looking at the house you are going to at the end of the street. You get there by taking one step after another. Materials help younger Christians keep on track both theologically as well as structurally. We want them to teach the needed truths. The printed page is an excellent guide because both teacher and student are looking at it. The material serves as a leader of sorts that both follow. Perseverance is needed to implement the training process. One cannot get the whole system going at once. One starts by training a few excellent teachers to train new Christians. Then we can train those new Christians how to train others as they proceed in their Christian growth. The most exciting part is that those that are trained the most will be the ones that grow the most. As they quickly grow, they will be training others with the same vision and tools. Older saints might not be very open to this biblical process. One can train a new generation in a rather short time with great results. This is because it works with the natural growth process. The church I attend ministers largely to students. Many are with us for only up to four years and then they are off finding jobs around the world. They come to know the Lord, are trained in one training session after another. They just expect every Christian does the same. Unless the church has a lot of trained people, just start off small with training new or young Christians. These new Christians will believe that this is how every new Christian is treated. One needs to find good basic training material. Each stage will need its own materials. Compare and look around. Talk to others. Keep cost in mind. Remember you want it to be something that the one who was just trained with the material will be able to use to train another. Of course, we need to keep in mind Elder John’s training guidelines. We build in the vision of training others as we teach the material usually, on a one-to-one manner. We unabashedly share with them that we expect them to help train others. We offer first to sit in with a more experienced person so they can see how to do it from a trainer perspective. This helps them not feel so intimidated. Everyone does it. Besides they have good support. When our church has a number of people who come to know the Lord at a certain evangelistic message, there are plenty of trainers to disciple these baby Christians. They know exactly what material to use and how many sessions to meet. The Lord loves it when His children all can share in the reward of making disciples. People do not need theological courses to do this. They need good training from the start and will learn to train others as they were trained. Let's look at how to develop keen leaders next. This is the power and problem of printed materials. The problem is that one cannot easily change the materials. This is the reason BFF’s materials are purposely made to adapt to the user’s needs. Start with the best ‘starter’ you can. Great sourdough bread depends on a great starter batch. In fact there are some that don’t end up training but many people do.